These plant lists have been developed based on our gardening experiences in Pullman, Washington and Moscow, Idaho, USA. Our region is in USDA Hardiness Zone 5. It has cold winters, hot summers, and wide temperature swings in fall and spring. We get about 21-24 inches of precipiation per year, but almost no rain falls in the summer. These plants should also perform well in many other parts of the country. They need fewer waterings than typical lawn grasses. They can tolerate, resist, or avoid drought AFTER they are established. They have attractive ornamental features. They have not been invasive under our growing conditions. We like them (well, there are some exceptions to this rule). The water requirements of these plants vary by species and by the size of the plant. Most of these plants will require some supplemental irrigation in the dry Inland Northwest. The amount of water that you will need to apply will also depend on your climate, soil type, and sun exposure. It is affected by cultural practices, including how you water your plants, whether or not you use mulch, and where windbreaks such as fences, walls, and other vegetation, are located. All plants require regular watering until their roots are established. For perennials, this means that they will need water on a regular basis at least during their first growing season. 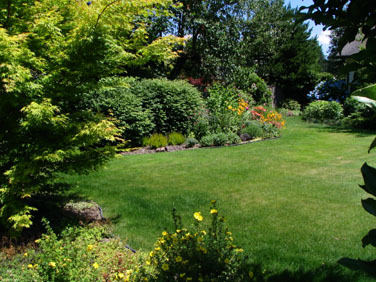 Trees and shrubs may require regular irrigation for up to three years after transplanting. Most of these plants are available in local garden centers and nurseries; others are more unusual, and we have only found them through mail-order sources. I teach classes on landscape plant identification, use, and maintenance. I have conducted research on water-conserving landscapes and spoken nationwide about it. I have also worked in garden centers and in an arboretum. I first became acquainted with the need for waterwise landscaping while working on my Master's degree at New Mexico State University, and I have incorporated water-conserving principles as well as native plants in my garden in Pullman for 2 decades. This site was developed in collaboration with Caroline H. Pearson-Mims, who has retired from WSU.